Whether you sell Retail, Wholesale or do Custom-Made … or all three, Showcase of Aussie Products can help cost effectively market your products, to genuine buyers using our unique “Piggy Back” Marketing Programme. Contact us and nominate all your manufactured/produced products which are GENUINE AUSTRALIAN-MADE or GROWN and we will list your business and its products, taking the information directly from your website, onto the Showcase of Aussie Products website at a cost of just $1.00 per product. Using up-to-date Search Engine Optimisation (SEO) & Authoritive Content techniques we will feature your product/s and make your product/s more readily found by your potential customer and improve their inquiry rate. 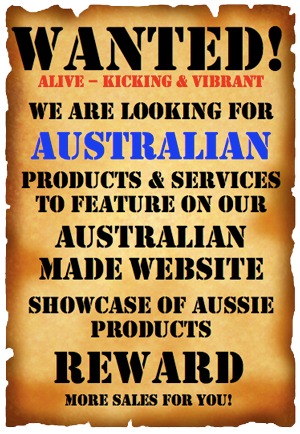 We are fanatical in preserving the integrity of our website’s content and it is interesting how many supposedly Australian Made product suppliers who want to list with us cannot guarantee that their products are Australian Made. To list your products on Showcase of Aussie Products there is a ‘one off’ cost of $1.00 per product plus an Annual Subscription Fee of $110.00. Initial payment to be paid within 7 days of notification of listing being completed. To see a copy of our Terms of Arrangement to list your business and its Australian Made products on Showcase of Aussie Products.